I was fortunate enough to receive a Herb Stovel Scholarship to attend this year’s conference hosted in Fredericton, New Brunswick. After joining many of the sessions between October 17–20, I noticed five key themes emerge from the conference and discussions. Dan Rose — Edmonton has a great system of mapping their Heritage Buildings by municipal zone. This way they know precisely which city councillor to call when a building is in danger. Heart Bombing at Valentine’s Day as a way of having the community say they love an endangered building. Saving Places in the United States has another version of Heart Bombing here. Or, maybe host a Preservation Pedal. Mallory Wilson presented the idea of Transitional Urbanism. These are longer than temporary tactical interventions, but not permanent solutions. They are building an inventory of all vacant buildings as a resource (many heritage buildings are cataloged in the process). Check out Entremise. Dinu Bumbaru — A great interactive map that anyone can contribute to or endorse ongoing efforts. They also offer a great “Toolkit” resource that explains how to take strategic action. Jill Taylor, Taylor Hazell Architects — A beautiful, poetic presentation about the Humber College Institute of Technology and Advanced Learning. The project repurposed/reimagined the Mimico Asylum for the Insane. Read about the history of the building and Taylor Hazel Architect’s poetic response. Jeremy Dutcher and Imelda Perley — An insightful closing session of song and reflection on the deep connection between land, language, and the Wolastoq people. See Jeremy perform on CBC Sessions. Bill Yuen — A relatively radical and progressive cultural landscape approach for the Chinatown area of Vancouver. Currently also undergoing a study for a Legacy Business initiative. Yew-Thong Leong — An ongoing project at Ryerson University using some of the latest technology to reconstruct Frank Lloyd Wright’s Banff Pavilion (demolished decades ago). A multi-disciplinary team conducting in-depth analysis using software like Rhino and Grasshopper to decipher and reconstruct sections of stone that were not photographed. Structural engineering and historical analysis to figure out how members were joined (Japanese joinery). Ground penetrating radar to find the old building foundation… and more (article for more information). Ryan Lee — An intern architect presents his thesis work titled “The Future of the Past: The Story of Toronto’s Palimpsests”. Ryan grapples with layers of history on a site through simultaneously revealing new and old work. Michael Philpott — A lively and interesting presentation on collecting oral histories of traditional building skills in Newfoundland and Labrador. Various media including audio, video, photographs, and drawings. 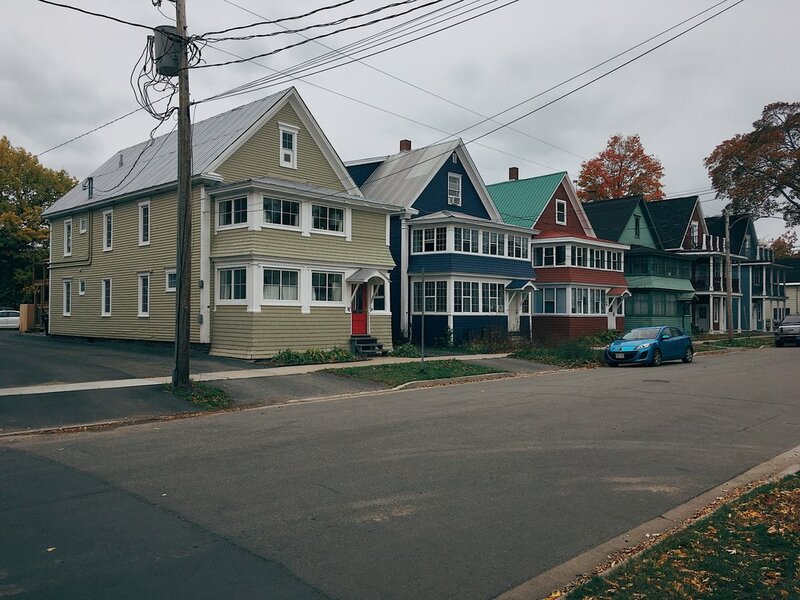 Neighbourhood Houses in the Rabbit Town area of Fredericton, New Brunswick. Yi Liu — Workshop and resources such as the Preservation Green Lab, Athena Institute, as well as other tools and insights. Kelly Vodden — Using a regional strategy to capitalize on heritage areas, like the Baccalieu Trail Heritage Region in Newfoundland. Kelly also presented several interesting initiatives including: “Hay Day” celebrations around rural Ontario. “The Festival of Small Halls” that takes place around PEI and Ontario where artists perform in local churches and halls. Heather Campbell’s presentation provided an excellent overview of the day and a clear summary of Canada-wide trends in rural heritage initiates. Six key points for success were: Networks; Support vs Risk; Cultural Heritage/Economic Drivers; Role of Natural and Cultural Resources; Immigration/Migration (policy); and Urban/Rural Relationships. Read more about Small. Thanks for another great conference. I met lots of amazing people, made new friends, and I’m looking forward to next year!